This Quick Start deploys the Ixia CloudLens platform with Eastwind Cloud Network Sensors in a highly available environment on the Amazon Web Services (AWS) Cloud in about 10 minutes. CloudLens is a data visibility platform that provides data access and capture, data grooming, and data delivery to security and monitoring tools. Eastwind Cloud Network Sensors are powered by CloudLens to provide intelligence and insight to help you identify and respond to threats in the cloud. This Quick Start deploys the Eastwind CloudVu sensor. This Quick Start is for users who would like to use these technologies to identify malicious activity, insider threats, and data leakage in their virtual private clouds (VPCs) and Amazon Elastic Compute Cloud (Amazon EC2) instances. Container-based CloudLens agents are deployed on your monitored instances, capturing packet traffic as they flow through these instances. The packets are sent over a secure tunnel to be analyzed and visualized in Eastwind’s software as a service (SaaS) platform. This gives you clear visibility into your network traffic, so you can identify unexpected network behavior, perform network analysis, and detect any intrusions. 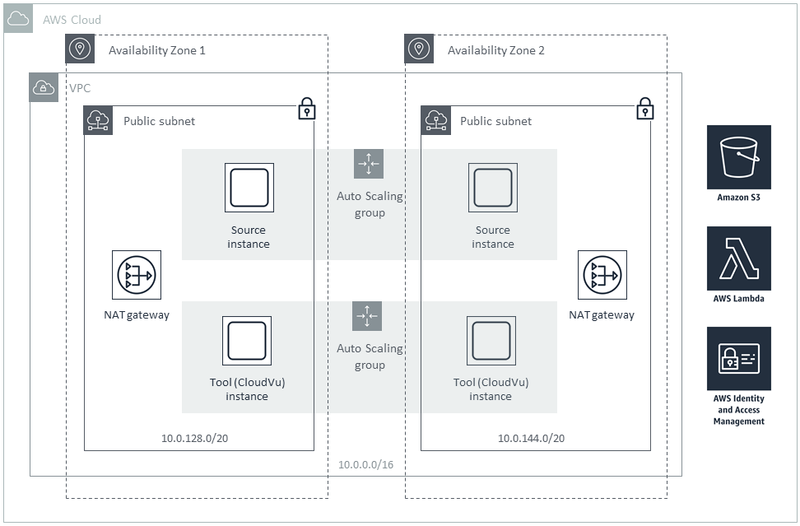 The Quick Start includes AWS CloudFormation templates and a guide that provides step-by-step deployment instructions. This Quick Start was developed by Ixia, a Keysight business, in collaboration with AWS. Ixia is an APN Partner. A source instance in an Auto Scaling group (of size 1). This is the application instance that you want to monitor. You can add more instances to monitor in the CloudLens project dashboard after deployment. The source instance has a container-based CloudLens agent deployed. This agent listens on all available interfaces and sends a copy of the packet stream to the tool instance for analysis. The Eastwind Cloud Network Sensor, CloudVu, in an Auto Scaling group (of size 1). This is the tool instance that analyzes the packet stream sent over by the CloudLens agent. Prepare your CloudLens account and find the project key. Subscribe to the Amazon Machine Image (AMI) for Eastwind CloudVu in AWS Marketplace and create your Eastwind account. Test the deployment by viewing a simulated threat and searching the network metadata that is generated by the Eastwind sensor. To customize your deployment, you can configure your VPC and change the settings for the source and tool instances. The AWS CloudFormation template for this Quick Start includes configuration parameters that you can customize. Some of these settings, such as instance type, will affect the cost of deployment. See the pricing pages for each AWS service you will be using for cost estimates. Prices are subject to change. This Quick Start requires a 45-day trial license for CloudLens. You can convert the trial license to a standard license at any time. The Quick Start uses an Amazon Machine Image (AMI) from AWS Marketplace for Eastwind CloudVu. Before you deploy the Quick Start, you must subscribe to Eastwind CloudVu in AWS Marketplace, and additional pricing, terms, and conditions may apply.